Hundreds of students gathered at the Ralph S. O’Connor Recreation Center on Friday to participate in the Student Involvement Fair (SIF), previously known as the Student Activities Fair (SAC Fair). 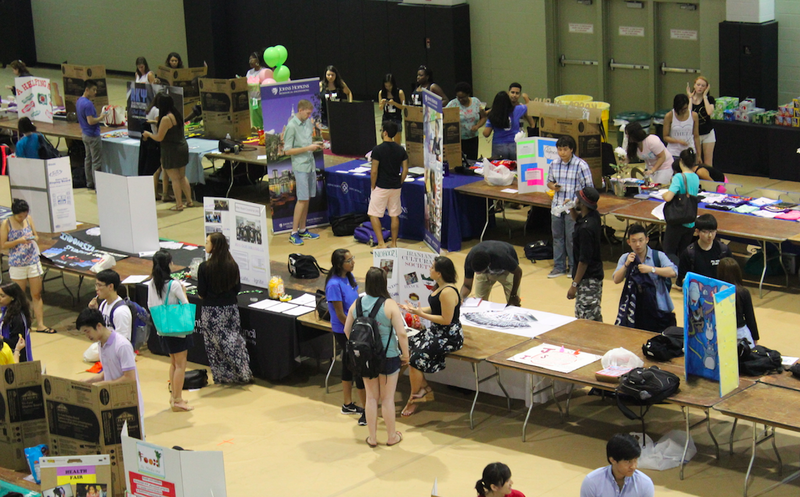 As part of a move to better organize the network of student clubs, all student organizations had to register on the Hopkins Groups website in order to get a table at the fair. According to some groups who were not able to get tables, the registration process was not straightforward. Senior Sam Gottuso, president of College Democrats, commented on the problems his organization experienced. According to Clifton Shambry, coordinator for Student Organizations, student leaders were reminded several times to register their organizations. The College Democrats registered their group to attend the SIF a week in advance of the deadline. The Student Involvement website states groups could sign up for the SIF once their leaders had registered their group on Hopkins Groups. Once completed, the primary contacts for clubs would receive emails with instructions on how to register. “[The process] wasn’t common knowledge. Only our old president was contacted and in our case she was in Botswana with limited email access… in the communications it never mentioned there were limited slots,” Gottuso wrote. Gottuso was informed the College Democrats had no table for the SIF two days before the event. The College Republicans had been given a slot and offered half of their eight-foot table to the Democrats. The Democrats were not on the official list of student groups in attendance, nor were they on the map of the Recreation Center that students used to find clubs that interested them. Hopkins J Street U also experienced some difficulties receiving a table. “We did end up getting a table, but we were on the wait-list because there was some miscommunication over the summer with registering,” sophomore Marty Feurerstein-Mendik, Hopkins J Street U treasurer, wrote in an e-mail to The News-Letter. Multiple clubs admitted they also attended the SIF without permission, in many cases due to the generosity of other student groups willing to share tables. Senior Phil Espinoza, the founder and president of Smash at JHU, a club dedicated to playing the Super Smash Bros. series of video games, said he registered his organization before the deadline but was put on the wait-list. “I guess I didn’t realize that there was a chance to be on the wait-list,” Espinoza said. The wait-list was meant to be only for groups that had not been given tables because they registered too late or didn’t register at all. “Typically wait-listers will arrive at the start of the Fair and take any of the tables that were not claimed by student organizations who registered on time,” the Student Involvement website states. Espinoza experienced some disorganization when it came to finding a table. HerCampus was denied a table after registering before the deadline, but they shared space with another group. Senior Megan DiTrolio, a HerCampus Campus Correspondent and editor, commented on the discrepancy. DiTrolio believes there are ways to include all the clubs. “The tables at the fair are extremely large… If all groups split tables, a solution that would not cause the school any more funding, the problem would cease to exist,” DiTrolio wrote.